John Henry Goldthorpe, born 26th September 1869, was the middle of the five brothers who were born and brought up at Haigh Farm, Stourton. Here they all had plenty of opportunity to practice football skills on the land known locally as Goldthorpe Pastures. 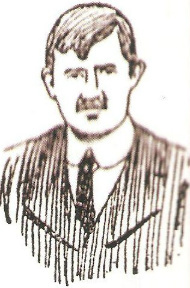 John originally played for Leeds Parish Church and first played for Hunslet as a guest in the 1885-86 season. He later gained a place in the Hunslet side without attaining the heights reached by Albert, James and Walter. In 1892 he shared the distinction of twice playing in the same Hunslet team as them, four brothers in the same side at the highest level surely a unique achievement. Although John did not play in the final he still earned a winners medal. Away from the rugby field John was in the police force based at various stations throughout Yorkshire. In 1912 John emigrated to Australia and then he moved on to New Zealand where it is belived that he made his home.